This was most pleasing – The good folk at Screenadelica let us participate in their Bestival operation this year offering us a choice of different performance artists that was ludicrously star-studded. We opted for perhaps one of the less kinda “off one’s nut” raving all night festival acts that was on the list (after considerable umming and hmmming indecision), and chose a guy that we figured might well get the prints on some more cute indie girl bedroom walls. 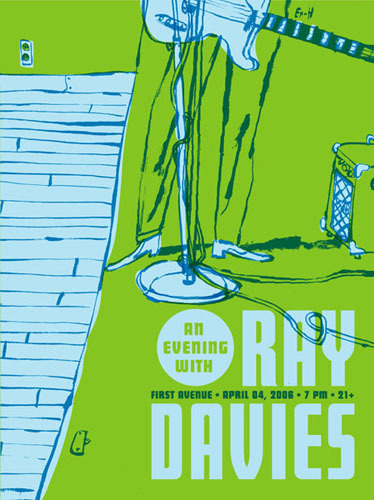 The original above that we based our homage on was by the very talented (and crucially pivotal in the music poster scene) Aesthetic Apparatus of Minneapolis. It’s pretty sweet as are they – check out their print process video below! …by the way, to spare us the screaming of print frustration, a friend stepped in to yell in pain on our behalf – we need to send props and gratuitous grunts? of gratitude to Mr Matt Dixon who screened our posters for us – fanks mush! 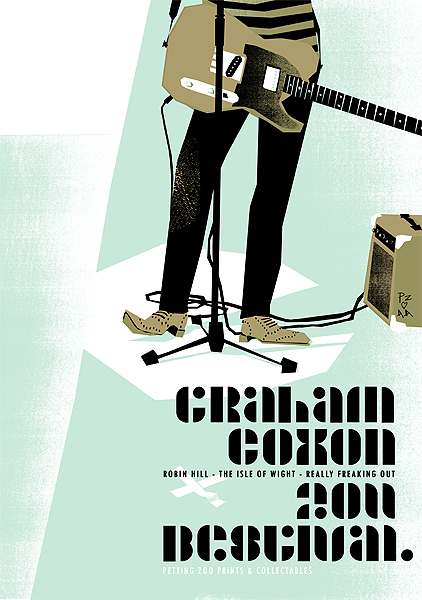 This entry was posted in Exhibitions, Festivals, Gigposters, Screenprints and tagged aesthetic apparatus, affordable art, art, bestival, festival, gigposter, graham coxon, limited edition, petting zoo, poster, print, screenadelica. Bookmark the permalink. in 2003 I dated an NYU student. The Push and Pull on the dorms’ front door were in that font. What is it? Hi Jacob! Actually that is a typeface we have been working on for some time now (we are always busy and often distracted when we are not – or tiddly) It was developed in 2010 for a series of posters celebrating Royal Bangs’ UK Tour (we shall backpost these soon)… A name for the face hasn’t been cemented but we’re veering toward something silly (as is the tradition for modern day ‘font’ design) …we will probably get around to finishing it this Autumn or Winter and will be selling it electronically for a very light sum… why not follow this blog to be among the first to know about its launch?